To say these waffles were amazing would be an understatement. These waffles could easily be one of my new top favorite breakfasts! I stumbled across the recipe from one of my favorite bloggers, RecipeGirl. She has fabulous recipes and ideas and this one is nothing short of spectacular. Everyone who ate them LOVED them, but seriously who wouldn’t?! They are INCREDIBLE! In a large bowl bowl, combine flour, sugar, baking powder, baking soda and salt. In a separate medium bowl, whisk together eggs, buttermilk, oil and vanilla. Add egg mixture to the dry ingredients. Stir until moistened; batter will be slightly lumpy and thats okay. Preheat a waffle iron and spray with nonstick spray. Pour batter into waffle iron, close the lid and bake until waffles are completely done (Each waffle iron is different so follow your waffle iron's instructions). Use a fork to remove finished waffles. Repeat with remaining batter until all the batter has been used. CINNAMON TOPPING: In a medium bowl, add butter, brown sugar and cinnamon and mix until well combined. Scoop the filling into a small zip baggie and set aside. CREAM CHEESE TOPPING: In a medium, microwave-safe bowl, combine butter and cream cheese and microwave for 30 to 60 seconds until it is just until melted. Stir together until smooth. Once smooth, mix in powdered sugar and vanilla extract. 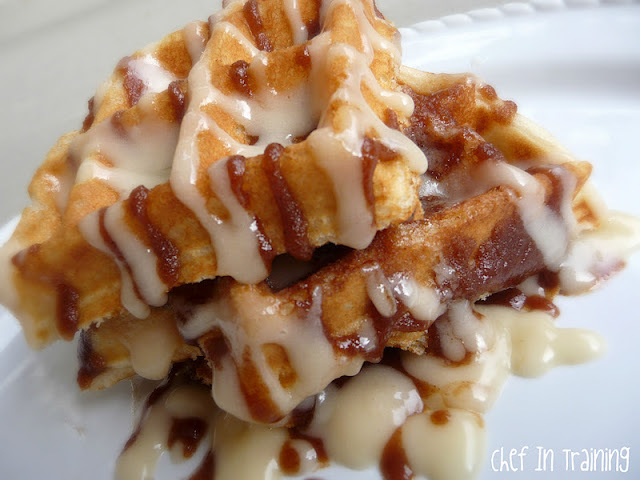 When ready to serve, place waffle on plate, drizzle cinnamon topping and cream cheese frosting over the waffle and Serve immediately. They sound delicious. I was just at a blog who made waffles with Grand Flaky biscuits. Wonder if you could do the same with the Cinnamon Rolls! Oh.my.goodness!! Cinnamon roll anything has me every time. These look sensational. Thank you for another fabulous recipe! We just finished off the Cookie Dough Dip - DELICIOUS!! Love this idea -- what a fun way to enjoy "cinnamon rolls" with half the work! oh my goodness! These look a-maz-ing! Wowza! Those waffles look amazing. Pinning them right now!! Sounds super yummy - thanks for sharing! whoa, i think i may have lost consciousness for second looking at those... they look soooo good! Thanks for sharing the recipe! Oh my heck!!! Yes, please!!! Oh my, these look just amazing! Pinning them so I can make them later. Can't wait! These sound so yummy! I am drooling over the cinnamon topping! Stopping by TT&J! These look and sound seriously delicious!! Wow! I think I'd have a major self-control problem if there were a plate of those in front of me. Please say you'll share the recipe at my party! Oh wow these look and sound incredible. Thanks for sharing these at this week's BFF Open House! Oh dear, these look amazing! I made these for my family, and although my husband thought he didn't really care for waffles, he said these were amazing! My whole family loved them, thanks for a new recipe that is going to be a family favorite! These waffles look yummy! I haven't had a waffle in years!! I guess it's time to dust off my iron and put it to good use! Made these and fell in love! Guess what we're having for breakfast on Christmas! My kids now think mom is a gormet chef and brag about me to their freinds! I know this is terrible but I plan to use frozen waffles. The thickest I can find. If things I fix aren't almost instant--my family would never have anything a little different and special. These are AMAZING!!!!!! Can't wait to try your other recipes! I made these today and they are just AWESOME! My son who says that I don't make anything good, liked these!! YEAAAAAAAAAAA!!! If you are in the mood for cinnamon rolls and don't want to go through the bother, these are for you. My Belgian waffle maker didn't like them, though: one side didn't cook well. And we had too much of the toppings. But the fam loved them. My husband said....,"I don't know where you found these....but keep them coming!!!" :)Great recipe ~ DEFINITELY a new family favorite!!!! Oh how wonderful! Pinned, Tweeted, and Google +'ed! Just too great not to share!!! These look wonderful and I am eager to try them for Christmas morning. I have a large (belgium) waffle iron and I am wondering how many waffles this recipe might make. Any idea? Thank you! 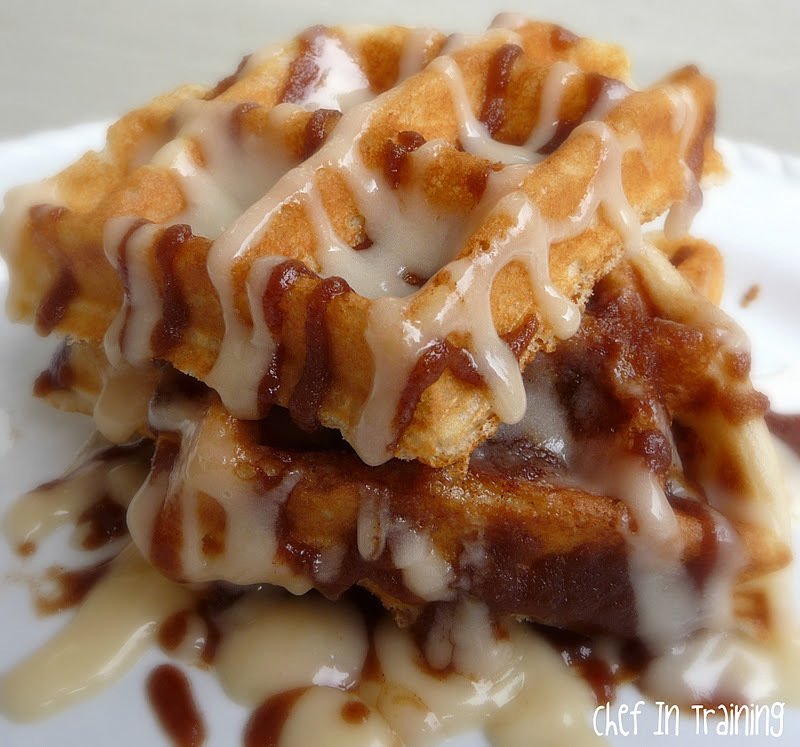 Cinnamon roll waffles sound amazing! They look like cinnamon rolls too! Hi! About how many waffles does this recipe make? What if I don't have buttermilk? Will reg milk do? This was my first pin when I joined Pinterest a couple of years ago. This past weekend I finally made these waffles. They are as advertised! Amazing. This is a real treat! Even though I couldn't make them as pretty as yours the taste was great!